Complicated VIP systems can be incredibly confusing for players. Poker rooms with easy-to-understand rewards systems are typically also the ones offering the best rewards – after all, they can’t trick you into thinking you’re receiving more than you actually are. Titan Poker just went through with an overhaul of its VIP system. The new Titan Rewards boasts several new developments that are on-par with the industry leaders. Some of the changes include simpler VIP levels, Club Points earned according to level acquired, real-time benefit accumulation, and a brand new Diamond VIP level. Diamond VIP is an annual achievement which the site’s high-volume players can aim to achieve each year. Additionally, casual players are now being offered a Monthly Cash option, where they can trade in 100 Club Points for $1. This is especially helpful for players who do not put in the time to achieve any VIP status level. The launch of Titan Rewards also comes with a new Titan Treasures feature, where players can collect Gold Coins by completing goals while at the tables. Coins can later be traded in for prizes. 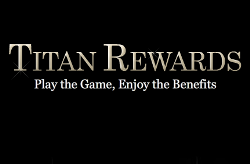 Titan Rewards’ motto of “Play the Game, Enjoy the Benefits” exemplifies the goal of the system. Players can simply play poker and collect rewards without worrying about complicated rewards calculations.